TAHOE/TRUCKEE, Calif. – Jan. 11, 2013 is the closing date for grant applications to be considered for funding during the joint 2013 Nature Fund – Martis Fund Grant Cycle at the Tahoe Truckee Community Foundation. A total of $100,000 will be granted. 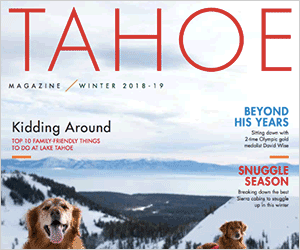 The Tahoe Truckee Community Foundation and the Martis Fund will again partner for the purposes of improving the natural environment of the region. They encourage all eligible projects to consider applying for funding. The purpose of the Nature Fund is to conserve the wildlife, lands, waters and air quality of the Truckee, North Tahoe and Donner Summit regions while creating opportunities for enjoyment of the outdoors. Desired outcomes include: Healthy lands, waters and air; vibrant fish and wildlife populations; available open space; educated, aware and appreciative community members. Activities that could support this goal include acquiring land or building trails, environmental education or restoration work. The issue to be addressed through the project should be clear and of high priority to the community. For a complete listing if possible activities and further guidelines, please look at the application guidelines at http://www.ttcf.net. The Nature Fund has $40,000 to give away. All activities and projects eligible for Martis Fund support must occur in Martis Valley or the greater Eastern Placer County region. The application is an online process. Please visit http://www.ttcf.net for more information, email phebe@ttcf.net, or call 530-587-1776. The Grants Committee reviews each application, makes site visits to and/ or interviews each applicant. Turn-around time is approximately six weeks. Completed applications must be finished by 5 p.m. on Jan. 11, 2013.